Dreams of Dust is a documentary that explores the long-term effects of climate change and drought in the communities of California’s Central Valley. The project looks at how the drought is impacting communities in the Valley and specifically how it has placed stress on areas that have had an inadequate or unstable water source for years. The project looks at the reasons why these communities have been unstable to begin with, how the drought is leading to further instability and migration within and out of the Valley, and what will happen in the future if the area continues to become drier and drier – as is predicted in years to come. A selection of these images were published by High Country News in November 2016. The project began last summer under the searing heat of the California sun in the state’s Central Valley. I drove for miles on lone highways, past farmworkers picking fruit in the hot sun, past dust devils swirling in dry winds. Fields of cotton, tomatoes, and corn, and orchards of almonds, pistachios, and walnuts blurred by my window; I had never seen such farmland. But interspersed with the crops were also acres of brown. Brown, dry, tumbleweed-enticing land. After hours of driving, I arrived in the heart of the Valley to learn how residents were coping with the thousands of dry wells and fallowed land left in the wake of California’s five-year drought. 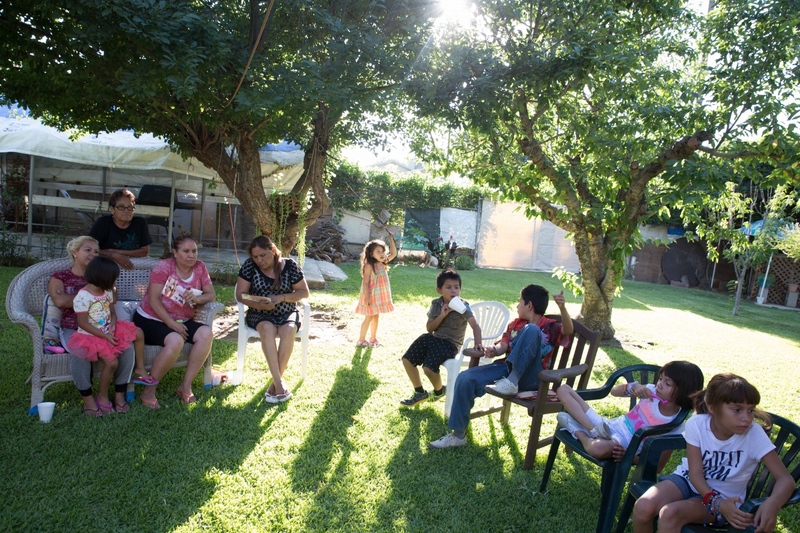 This summer, I saw the beginning of an exodus of farmworkers from the Valley and I also saw families trying to make ends meet so that they wouldn’t have to leave. I realized that the California dream – and its icon as a destination for those seeking wealth, adventure, or simply a better way of life – is threatened. The state is beginning to experience the effects of climate change, manifested by severe drought and warmer temperatures, and I saw that declining groundwater levels and a diminishing snow pack is already changing daily life for many Californians. Dreams of Dust aims to document the movement of people in the state due to these changes. 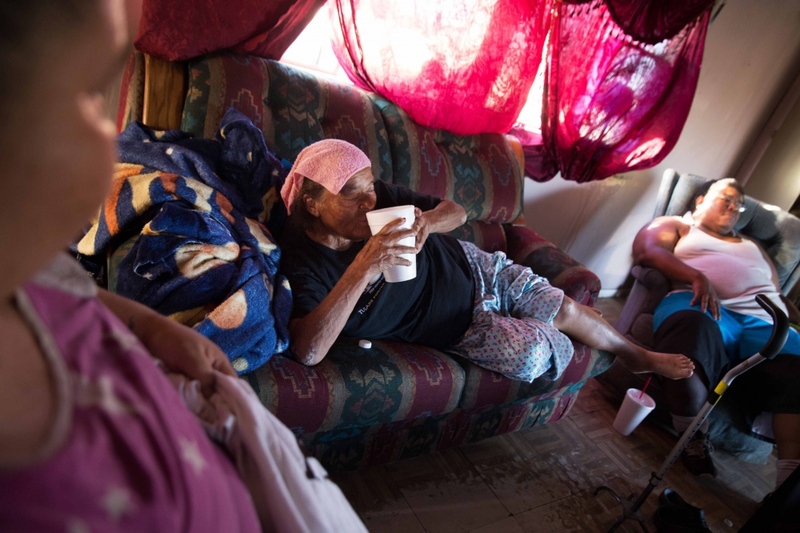 Hilda Garcia, 62, drinks water to help cool down from 106 degree heat in Okieville, California. 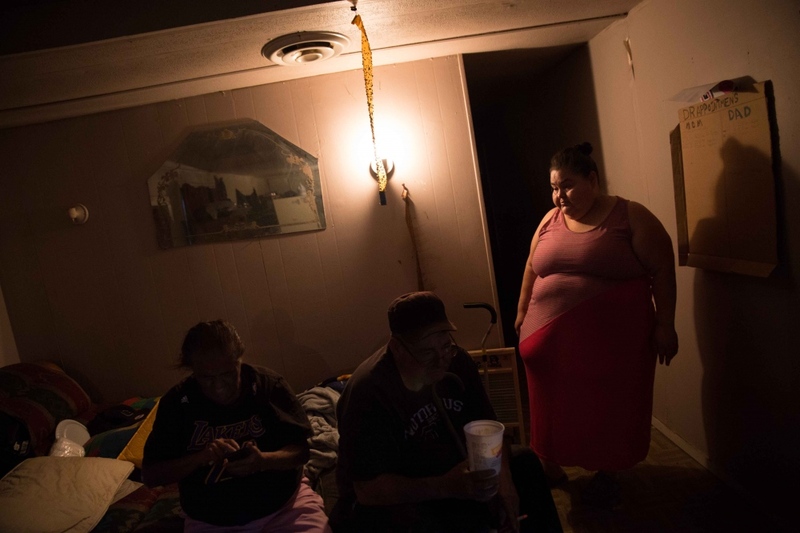 After several months without a home, she finally found a trailer to move into with her husband, daughter, and son-in-law, but they soon learned that there was no water because the well had gone dry. July 2016. 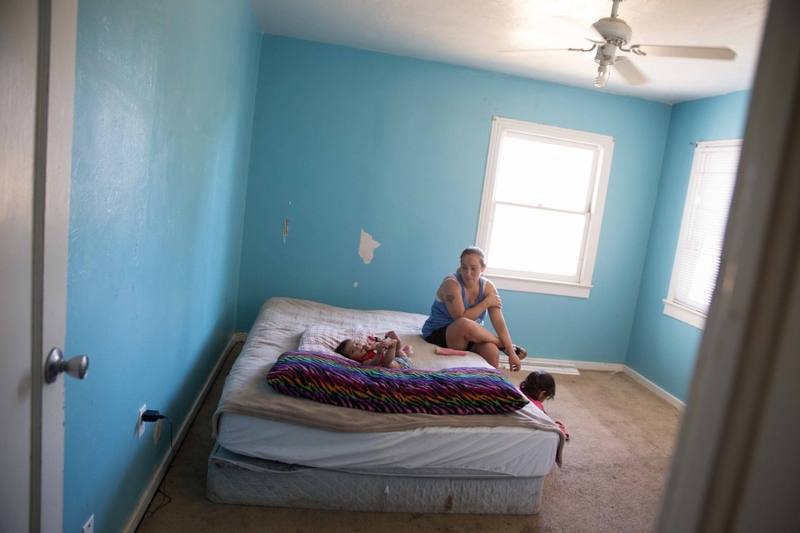 Cella Mendoza, 36, lives in a house that hasn't had running water since the property's well went dry over a year ago. Her husband, Renee, signed up for California's Drought Housing Relocation Assistance Program to help cover the cost of moving to another house and to help with rental payments for one year. He has been trying to move for months but he says it's been difficult to find a place that will accept him, his wife, and their nine children. June 2016. 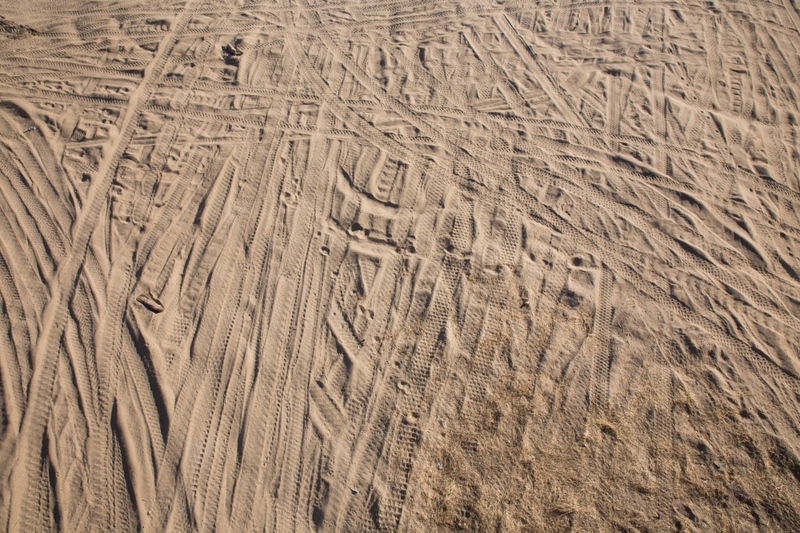 Tire tracks mark the sandy river bottom of the Kings River in Kings County, California. The river has been left with little to no water this year because of extreme drought, with the county receiving 1.6 inches less than normal as of June 12, 2016. Before the river was tamed for large-scale agricultural and urban use, it used to drain into Tulare Lake, once the largest freshwater lake west of the Mississippi. The lake went dry in the 1930s after farmers cut off the supply of four rivers, including the Kinds, that emptied into its basin. June 2016. Lupe Vargas shells fresh garbanzo beans for dinner outside her home in the Woodville Labor Camp. Since the 1930's, the camp has provided housing for farm workers who are in need of an inexpensive place to live. Labor camp residents must receive 65% of their income from farm work - although with the drought, that work is becoming harder to find. June 2016. 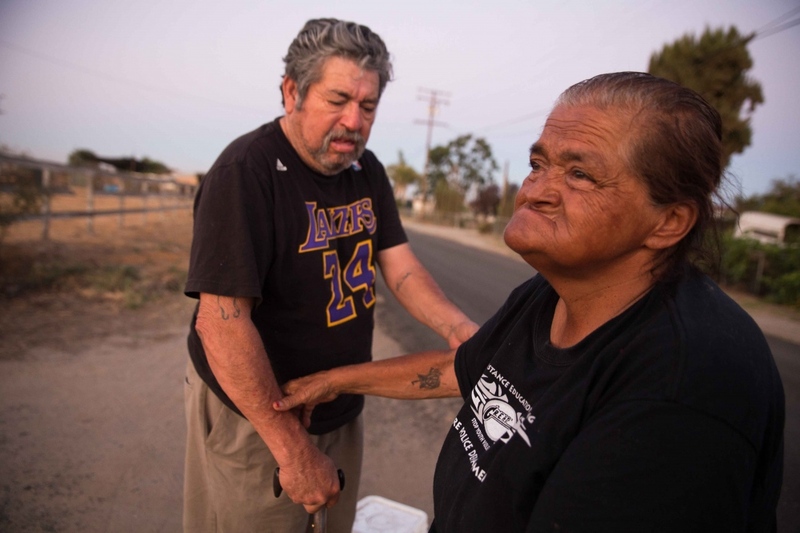 Hilda Garcia holds the arm of her husband, Eliseo, as they wait for a ride to the town of Tulare, 8 miles away, to fill up water jugs. In early June, they moved into a trailer that had no running water since the well on the property had dried up. "You can't do without water, it's very very hard. It makes me cry," says Hilda. June 2016. 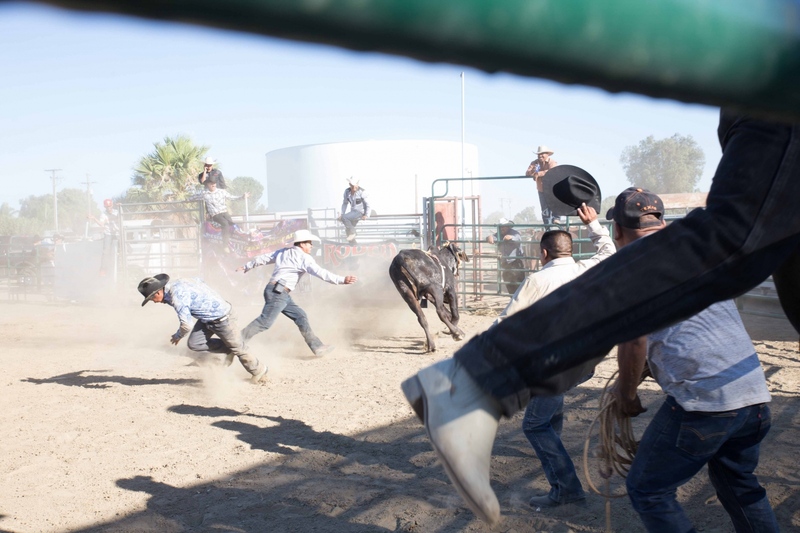 Men run from a loose bull during a rodeo in Huron, California. 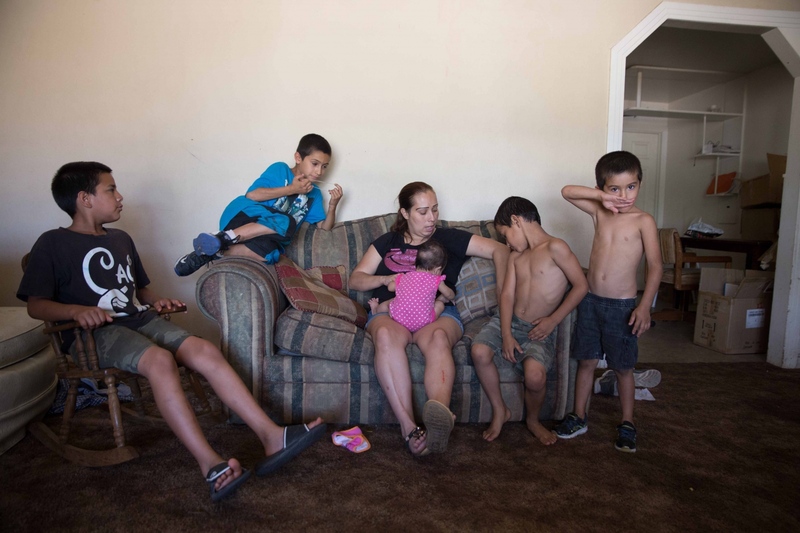 Drought has taken its toll on towns in the westside of the Central Valley and Huron has seen its population dwindle as farmworkers move to other cities and states where there is more work. July 2016. Rosemary Garcia is the daughter and caretaker of her parents, Hilda and Eliseo. She was living with them in her mother's car before they found a trailer to move into in Okieville, California. "I didn't find out 'til after we came that there was no water. It's hard, we can't do it like this," she says. June 2016. 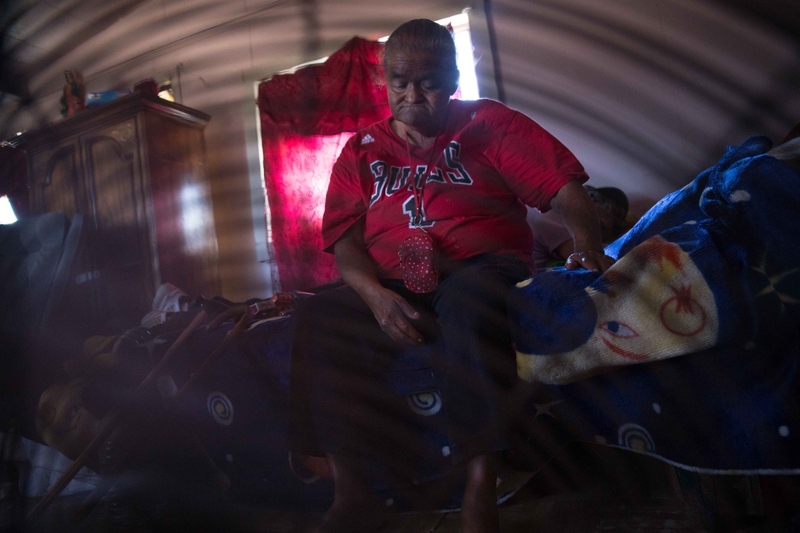 Hilda Garcia sits under a fan, trying to keep cool on a triple digit day in Okieville, CA. June 2016. Cella Mendoa is the mother of nine children, ages 8 months to 15 years. Cella and her husband have been struggling to make sure they have enough water to drink, cook, and clean with. "Not only that," says her husband, "CPS [Children Protective Services] has been called to try to take our kids away because there's no water." But Tulare County stepped in and said if they were going to take his kids they would have to take all the kids in East Porterville, a community that has seen hundreds of residential wells go dry. June 2016. 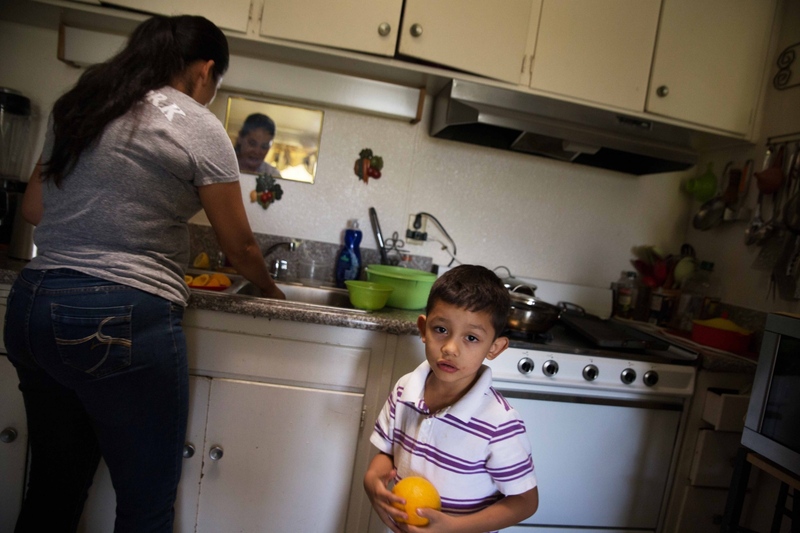 Lupe Vargas cleans oranges for her son, Emmanuel. 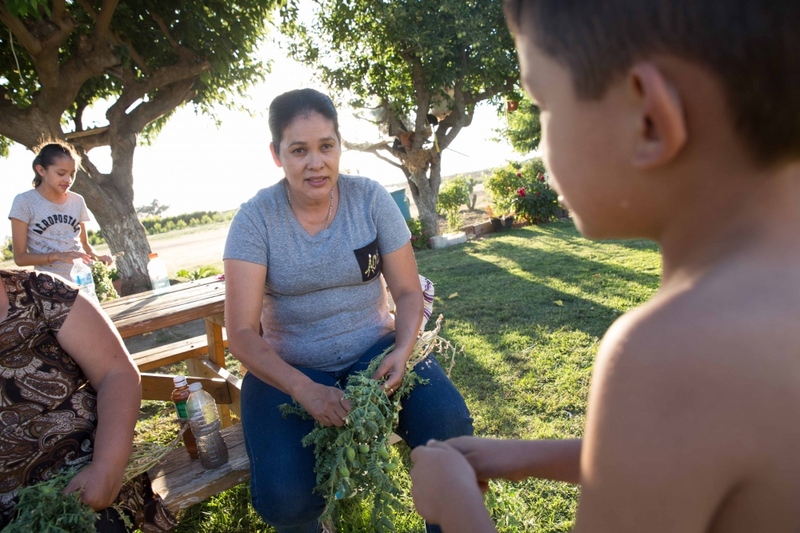 The Vargas family and others in this community of mostly farm workers worry as they've watched the amount of work available decrease over the last few years. A combination of less water (leading to fallowed fields), mechanization, and changes in the types of crops grown in the region have all led to a decrease in the demand for farm labor throughout the Central Valley. June 2016. 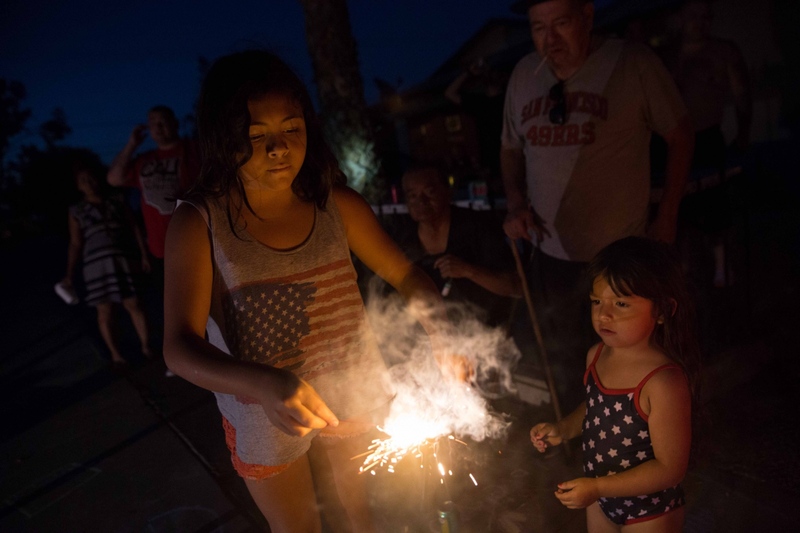 Hilda and Eliseo Garcia watch their grandkids light fireworks on Fourth of July in Tulare, California. She says she can't light any near her trailer for fear of starting a fire; the grass is too dry and there is no water source to fight flames. June 2016. Juan Lomeli rests after a long workday in the fields in the westside of California's Central Valley. 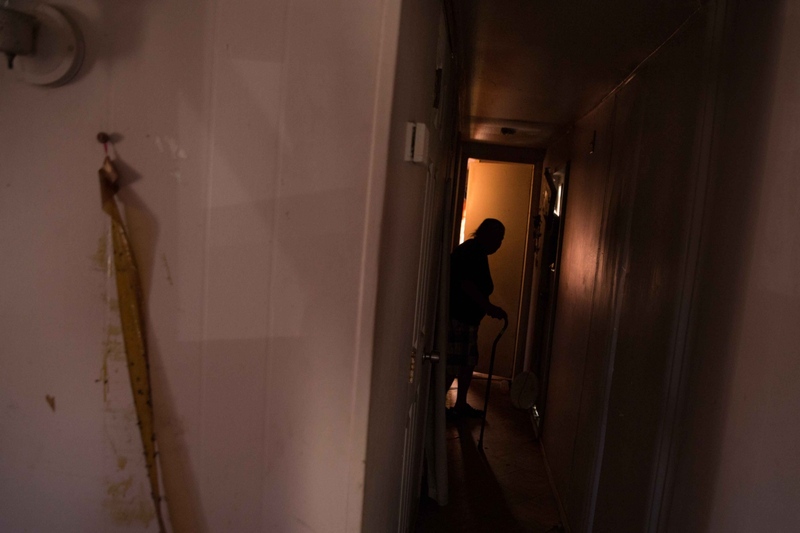 He has slowly lost work due to the California drought and had to move his family from their house in Huron, California, to a labor camp, 30 miles away. He hopes that they don't have to move away from California all together. July 2016. 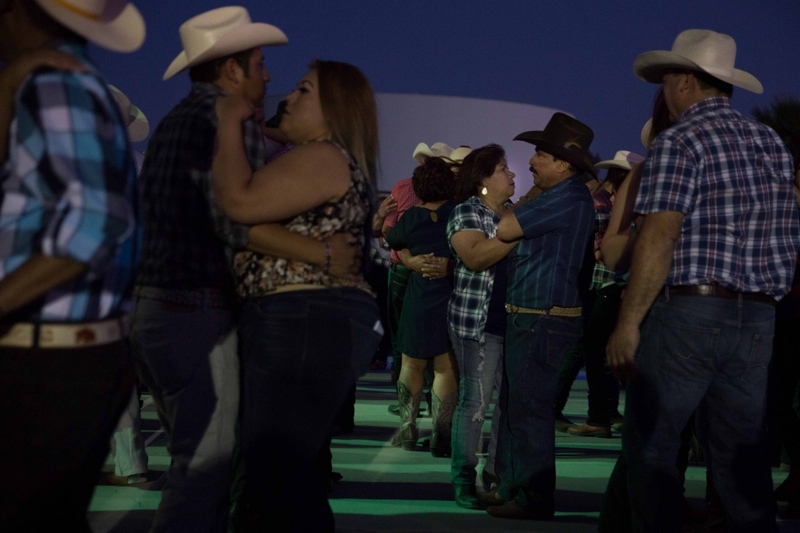 Juan Lomeli dances with his wife, Marielle, at a rodeo in Huron, California. Even though they had to move away from the predominately farmworking town due to a lack of work, they return often to see their friends and family. July 2016. A girl plays in the sunlight during a community meeting in Tulare, California, organized by Sandra Garcia to educate residents about water contamination and the importance of drinking clean water while at work. After her mother died of cancer - which Sandra believes was caused by an overexposure of pesticides - she founded the grassroots organization, Campesinas Unidas, to fight for the rights of farmworkers. June 2016. 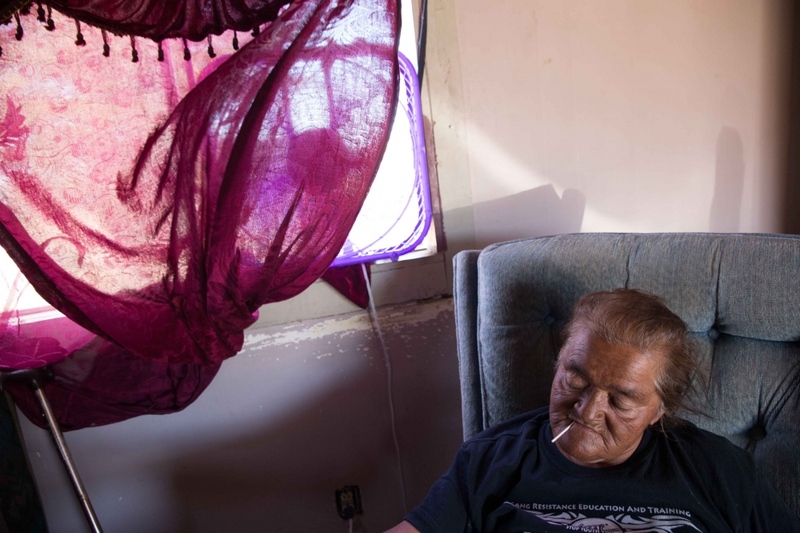 Hilda Garcia sits in front of a fan in her trailer in Okieville, California. She has a swamp cooler, but no water to put in it to keep cool. June 2016. Kids walk in between a walled-off resevoir and an empty canal near their home in the Woodville Labor Camp, near Woodville, California. They remember playing in the canals years ago when they used to be full. June 2016. 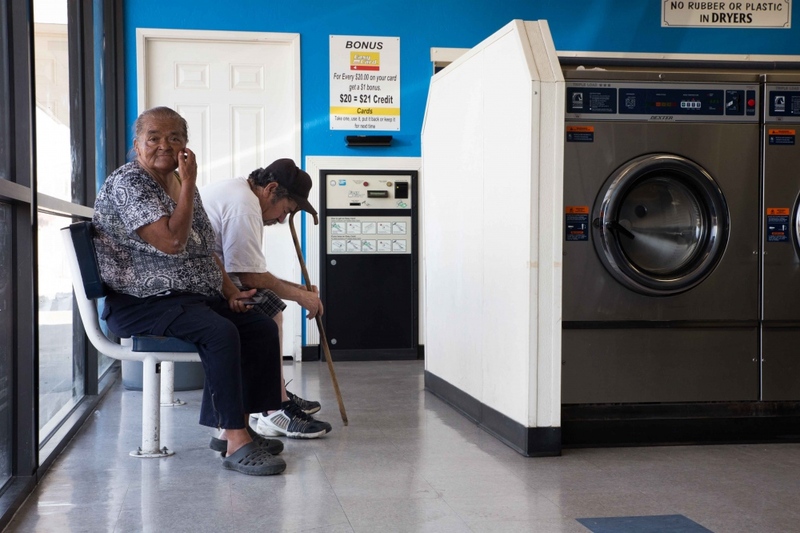 Hilda and Eliseo Garcia wait for their laundry in Tulare, California. "My washer works [at home] but we got no water there, that's the problem!" she says. June 2016. 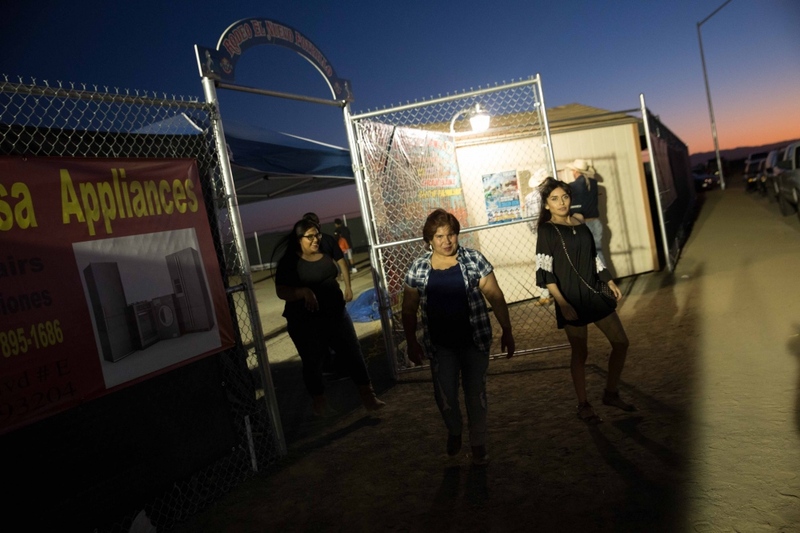 Marielle Lomeli, her daughter, and her neice, leave the Huron Rodeo after a night of watching bull-riding and dancing under the stars, and head to their new home in the Farming D Labor Camp, outside of Five Points, CA. Marielle tells me she hears of families leaving Huron for Arizona, Oregon, or Washington, even back to Mexico -- places where they hear jobs are more plentiful. July 2016. 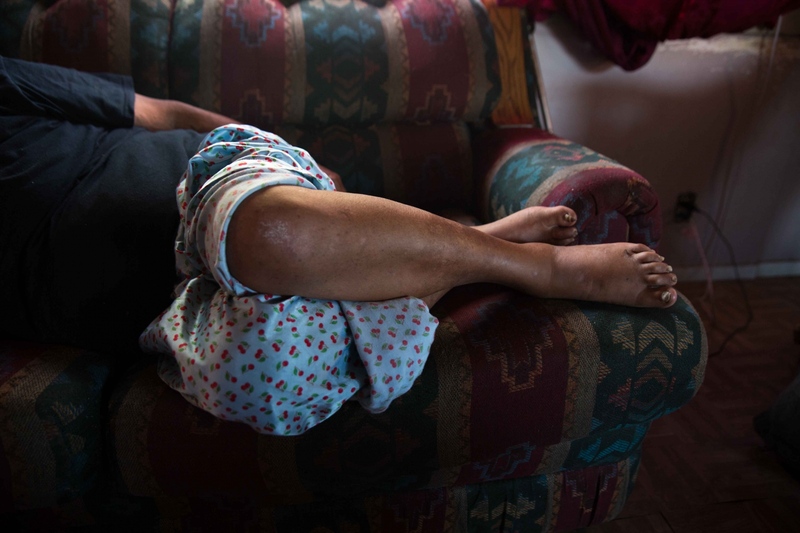 Hilda Garcia lies on the sofa in her trailer in Okieville, CA. The intense heat and no running water has put stress on her and her husband who currently suffer from several health problems. She says the heat makes her feet swell and makes it painful to walk. June 2016. 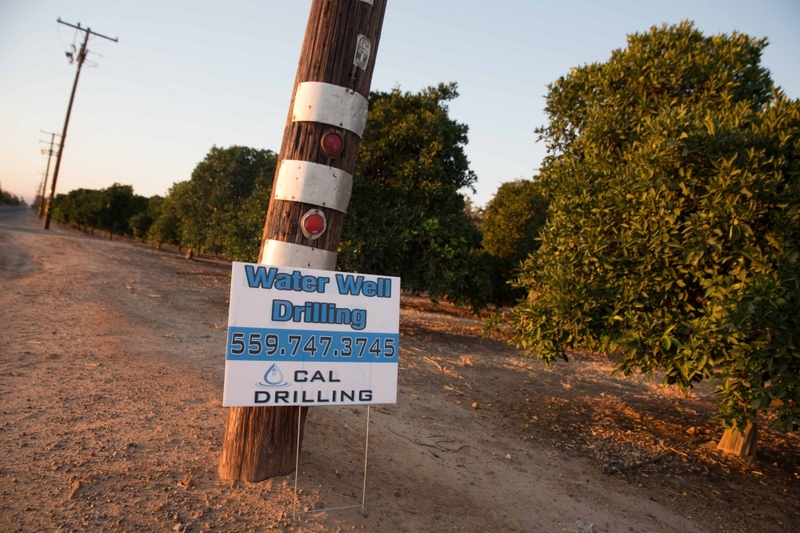 Signs that advertise companies that drill water wells are scattered throughout towns and fields in the Central Valley. Over 5,000 new wells have been drilled in Tulare County - the epicenter for the drought - this past year, but at the same time about 2,000 wells have failed. June 2016. 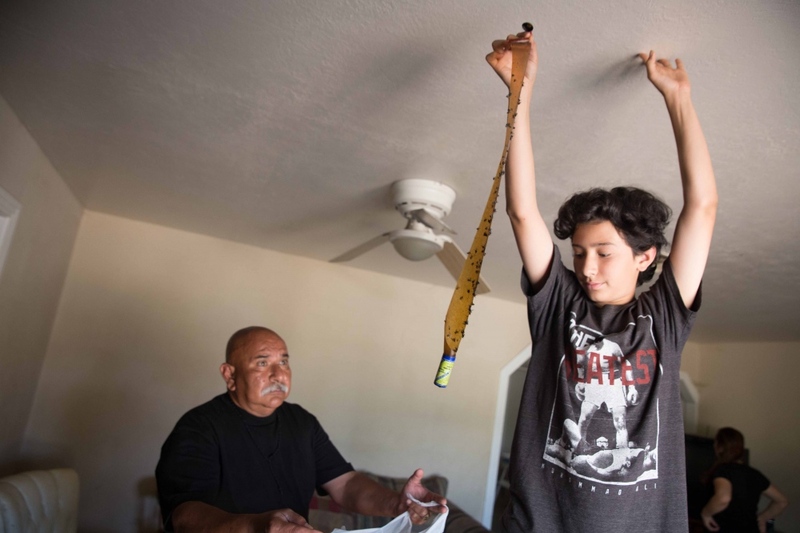 Anthony Mendoza, 12, throws away a fly strip into a bag his dad is holding. Because their home in Taurusa, California, has been without water for over a year, their sewage system is backed up and attracts flies. June 2016. 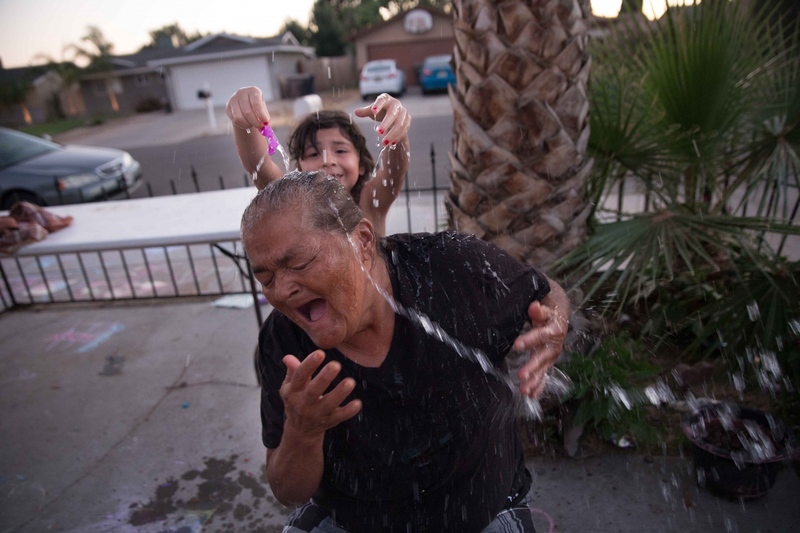 Hilda's granddaughter bursts a water balloon above her head. 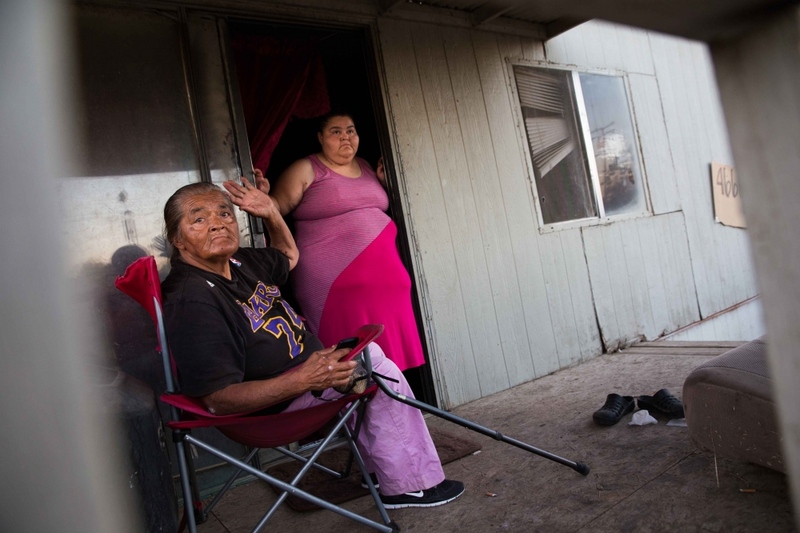 Her grandaughter lives in Tulare, California, a ten-minute drive and a world away from her current situation in Okieville, where she has been living for weeks without running water. "You just need water, that's all I gotta say. I can't live without water, I'm old. Not just old, even if you're young, you need water for everything. You just need water, that's all I gotta say," she says. July 2016. Hilda and Eliseo Garcia sit on their front porch with wet towels to cool off from the intense summer heat. It's not unusual for the temperature to stay in the triple digits for days, sometimes weeks. June 2016. 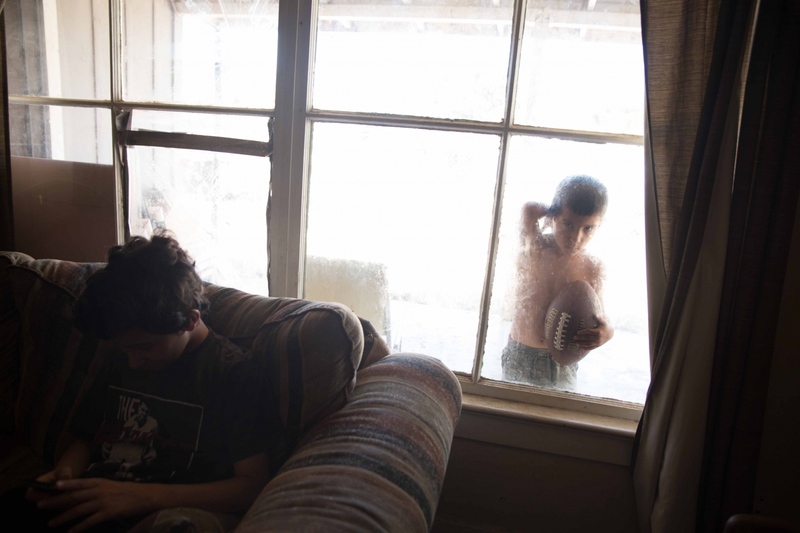 Gabriel Mendoza, 5, looks in the window of his home in Taurusa, California. The Mendoza's are one of seven families in Tulare County that have signed up for the California Drought Housing Relocation Assistance Program - a small number compared to the thousands of homes that have lost their wells. Because the assistance program is fairly new, many people don't know about it - and if they do, there are a lot of steps and paperwork to complete before being elligible for funds. June 2016. The sun sets behind a field of walnut trees near Taurusa, California. Because of the lucrative market for nuts in recent years, new nut orchards have been planted up and down the Central Valley. 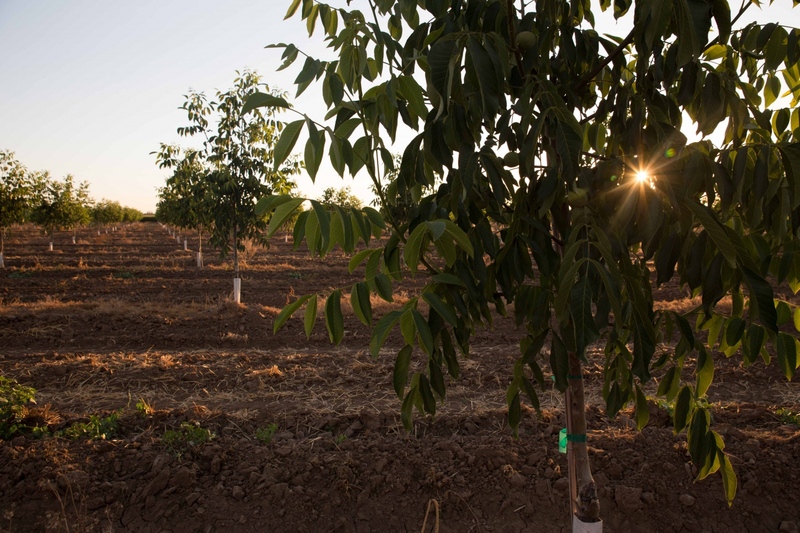 But planting trees is counterintuitive during the drought; nut trees take years to mature, require a permanent supply of water, and are one of the state's thirstiest crops. (They need one third more water per acre than grape vineyards.) Nut trees also are more mechanized and don't require as much manual labor as other row crops, thus decreasing the amount of work available for farmworkers. June 2016. Hilda waves to a fellow neighbor outside her home in Okieville, California. 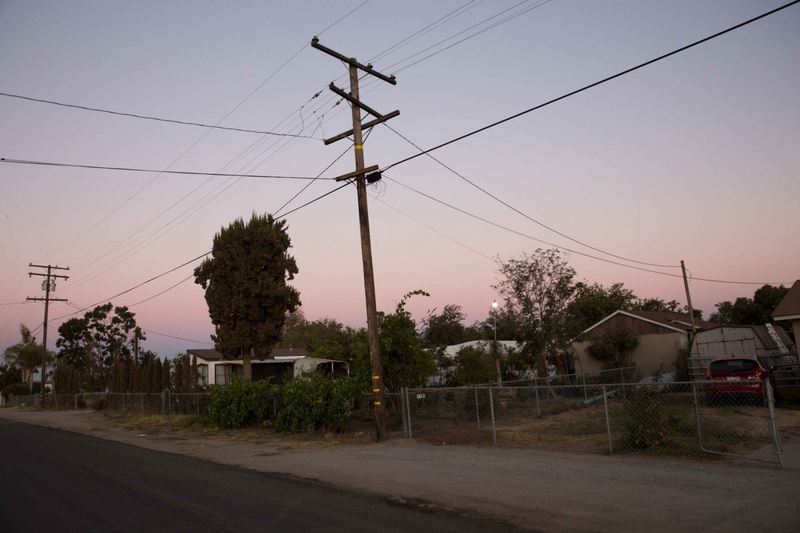 Seventy percent of communities in the Tulare Lake Basin - including Okieville - are considered disadvantaged communities by the State of California. Nearly all of these communities have water quality or water quantity problems, many of which have existed for decades. The drought has not created these problems but has exacerbated them. July 2016. Dusk in Okieville, California. 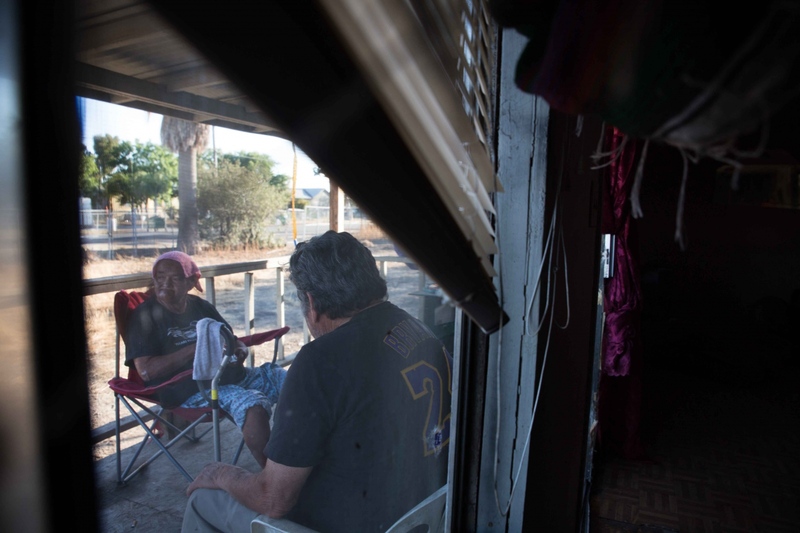 Most of the residents of Okieville, which include both Dust Bowl migrants and Hispanic farmworkers, have wells that have gone dry, with more wells expected to go dry in the near future. Hoses criss-cross the streets, delivering precious water from one house to another, and green water tanks sit on almost every brown lawn. July 2016. 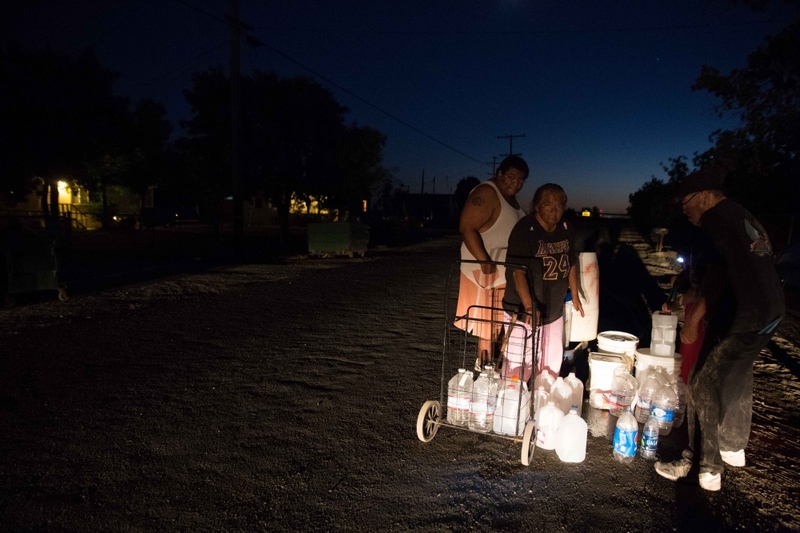 Hilda Garcia and her family fill up their various jugs and buckets from a neighbor's hose as night falls in Okieville, California. "This is how we fill water," says Hilda, "A lot of hassle, huh? You do what you got to do when you're homeless and got no water." July 2016. Hilda in the hallway of her trailer home. This June, she was trying to recieve help from Tulare County to receive a temporary water tank, but their response was slow. "I live in Tulare County, I don't have a vehicle and you can't bring me water? It's not an emergency? I'd figure it is, but I can't get no help. Who else can I call?" After living without running water for a little over a month, help arrived. The county installed and connected a tank to her house. June 2016.